Advance 375A Granular Ant Bait is a special combination of the popular Advance Formula 1 and the Advance Carpenter Ant Bait. You get both baits in 1 container ! 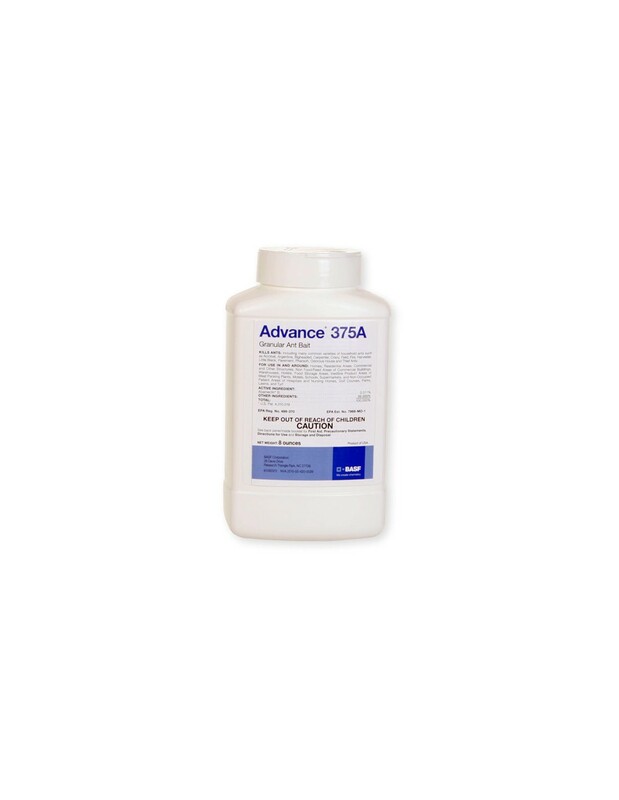 Advance 375A Granular Ant Bait is a protein-based bait that is a ready-to-use product for use in controlling numerous ants both indoors and outdoors. This bait formulation combines a mixture of foods and the delayed action insecticide, Abamectin. This insecticide acts to reduce the population of worker ants and can cause an immediate halt in egg production resulting in colony elimination. Avoid use of other insecticides or sprays on or near this product. It also kills most species of ants including: acrobat, argentine, bigheaded, carpenter, crazy, field, fire, harvester, little black, pavement, pharaoh, odorous house and thief ants. For use in and around homes, residential areas, commercial and other structures, non food areas of commercial buildings, warehouses, hotels, food storage areas, inedible product areas of meat packing plants, motels, schools, supermarkets, hospitals and nursing homes, golf courses, parks, lawns and turf. Advance 375A Granular Ant Bait contains Abamectin B1 - a natural soil borne agent. Abamectin B1 is a GABA inhibitor that interferes with the normal functioning of an insect's nervous system and begins affecting ant populations within 24 hours. This type of insecticide allows the ants time to take the bait back to the nest where it is distributed throughout the colony. Reproduction of the colony halts once the queens have been eliminated and the workers, who carried the bait, perish. 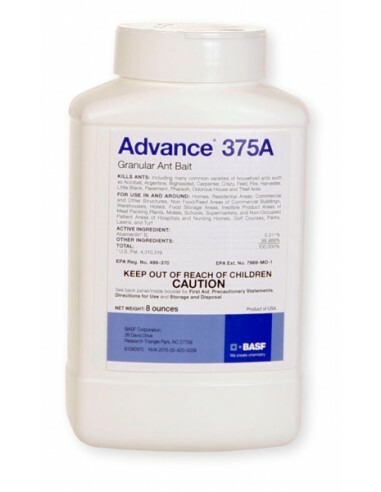 Advance 375A Granular Ant Bait is a ready to use product for use in controlling numerous ants both indoors and outdoors. This bait formulation combines a mixture of foods and the delayed action insecticide, Abamectin. This insecticide acts to reduce the population of worker ants and can cause an immediate halt in egg production resulting in colony elimination. Avoid use of other insecticides or sprays on or near this product. OUTDOORS - BROADCAST APPLICATION: Use this product at a rate of 8 oz. per 1/2 acre. This is equivalent to approximately 1.8 ounces per 5000 sq. ft., or 0.4 ounces per 1,000 sq. ft. (One tablespoon equals approximately 0.3 oz. of bait.) Apply the product as uniformly as possible. Repeat application as necessary. INDOORS - LOCATE ANT ACTIVITY: Follow ants back to voids. Apply product to cracks and crevices or voids where ants are active. In heavily traveled sites use up to 1.5 ounces of product. Use a large Centrobulb* puffer or other appropriate application device to place the product into crevices or voids. Repeat application as necessary. Most species of ants including: acrobat, argentine, bigheaded, carpenter, crazy, field, fire, harvester, little black, pavement, pharaoh, odorous house and thief ants.